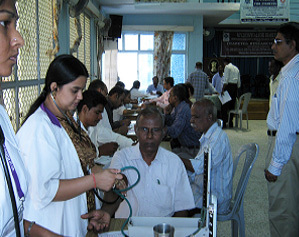 Participants in the camp being tested by medical team from M.V.Hospital for Diabetes, Royapuram. 1st MULTINATIONAL STUDY GROUP MEETING ON THE DIABETIC FOOT & WOUND HEALING CONDUCTED AT CENTRAL LEATHER RESEARCH INSTITUTE, ADYAR, CHENNAI FROM 12th TO 13th DECEMBER, 2009. 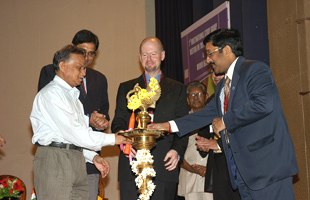 Mr. A.B.Mandal, Director, CLRI [left] lighting the traditional lamp to inaugurate the Scientific Programme. 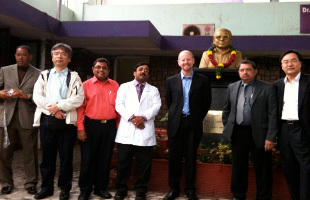 Dr.Vijay Viswanathan, Managing Director, M.V.Hospital for Diabets, Royapuram [right] and Dr.David G.Armstrong, Professor of Surgery & Director, Southern Arizona Limb Salvage Alliance, University of Arizona College of Medicine, USA (centre) are seen. In the second photo, sitting from left to right Dr. Anil Bhansali, Organizing Vice Chairman, Professor and Head, Dept. of Endocrinology, PGIMER, Chandigarh, Dr.Sharad Pendsey, Organizing Chairman, Diabetes Clinic & Research Centre, Dhantoli, Nagpur, Mr. A.B.Mandal, Director, CLRI , Dr.Vijay Viswanathan, Managing Director, M.V.Hospital for Diabetes, Dr. David G.Armstrong, Professor of Surgery & Director, University of Arizona College of Medicine, USA at the inaugural session of the two days scientific programme. 1st Multinational Study Group Faculties during their visit to M.V.Hospital for Diabetes, Royapuram, Chennai on the eve of the Group Meeting on the "Diabetic Foot & Wound Healing". 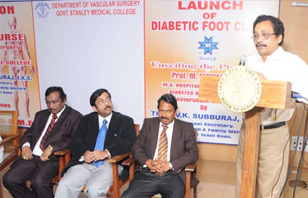 From Left to Right on the 1st Photo near the Footwear Department, Dr. Lawrence B. Harkless, Founding Dean, Professor, Podiatric Medicine & Surgery, College of Podiatric Medicine, California, USA, Dr. Vijay Viswanathan, Managing Director, M.V.Hospital for Diabetes & Dr. David G. Armstrong, Professor of Surgery & Director, Southern Arizona Limb Salvage Alliance (SALSA) & University of Arizona College of Medicine, USA. From Left to Right on the 2nd Photo, Dr.Lawrence B.Harkless, Dr.Shigeo Kono, Director, WHO Collaborating Centre for Diabetes Kyoto Medical Centre, Japan, Dr. Z.G. Abbas, Consultant Physician, Muhimbili University College of Health Sciences, Tanzania, Dr. Vijay Viswanathan, Dr. David G. Armstrong, Dr. Sharad Pendsey, Director, Diabetes Clinic & Research Centre, Dhantoli, Nagpur, Dr. Jin Woo Lee, Professor, Director of Diabetic Foot Clinic, Severance Hospital, Yonsei University College of Medicine Seoul, South Korea are seen. About 1st Multinational Study Group Meeting. The aim of the study group is to build bridges between experts working in the field of the diabetic foot in different parts of the world. With this formation of a multinational study group, it would be possible to identify newer innovative techniques to diagnose and manage diabetic foot, and other conditions like off loading wound healing, treating diabetic neuropathy, arterial and foot infections and the main focus of the study is to encourage research in the field of diabetic foot, which is, at present lacking in many of the countries. USA, Saudi Arabia, Tanzania, Bangladesh, South Korea and Japan took part in the 1st Multinational Study Group Meeting and shared their experience on the management of the diabetic foot in their own countries. DIABETIC FOOT CLINIC AT GOVT. 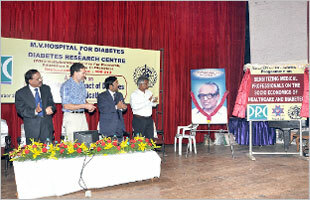 STANLEY HOSPITAL IN MEMORY OF PROF. M. VISWANATHAN LAUNCHED ON THE WORLD DIABETES DAY ON 14th NOVEMBER, 2009. Public-Private Partnership: M.V.Hospital for Diabetes, Royapuram, Chennai, has donated equipments for setting up a Diabetic Foot Clinic at Govt. 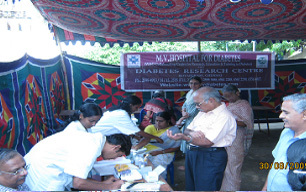 Stanley Hospital, Chennai on the World Diabetes Day on 14th November, 2009. Photo (Left) Thiru V.K.Subburaj, Principal Secretary, Health Govt. of Tamilnadu (2nd from left) unveiling the plaque of late Prof. M.Viswanathan, who started the first organized Diabetes Clinic in India in 1948 at the Govt. Stanley Hospital. Dr.Vijay Viswanathan, Managing Director, M.V.Hospital for Diabetes (extreme left) & (from Right to Left) Dr. A. Priya, Dean , Govt. Stanley Medical College, Prof. S.K.Rajan, Chairman, Board of Studies, the Tamilnadu Dr. MGR Medical University, Dr. M. Rajkumar, Professor of Vascular Surgery are seen. Photo (Right) Thiru V.K.Subburaj addressing the gathering. 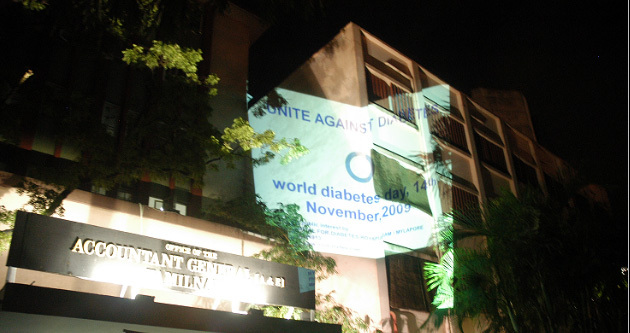 "Unite against Diabetes " was the public message delivered by M.V.Hospital for Diabetes & Diabetes Research Centre on the occasion of World Diabetes Day on 14th November, 2009. Accountant General, Tamilnadu office at Anna Salai, Teynampet was selected for this show from 7 p.m. to 9 p.m. and the message is reflected on the building with a blue ring representing World Diabetes Day. 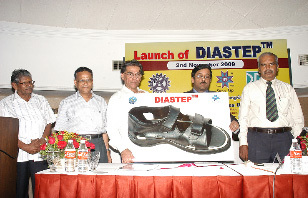 LAUNCH OF DIASTEPTM FOOTWEAR DESIGNED FOR PEOPLE WITH DIABETES AND LOWER RISK FOOT ULCERS JOINTLY BY CLRI AND M.V.HOSPITAL FOR DIABETES AND DIABETES RESEARCH CENTRE AT A FUNCTION HELD ON MONDAY, 2nd OF NOVEMBER, 2009 AT HOTEL SAVERA, CHENNAI. 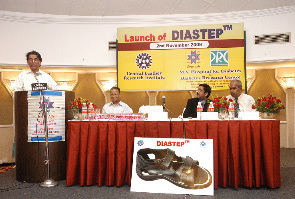 Dr. T. Ramasami, Secretary, Department of Science and Technology, Government of India (3rd from left) launching DIASTEPTM footwear. Dr. Vijay Viswanathan, Managing Director, M.V.Hospital for Diabetes and Diabetes Research Center ( 4th from left) and CLRI Director Mr. A.B. 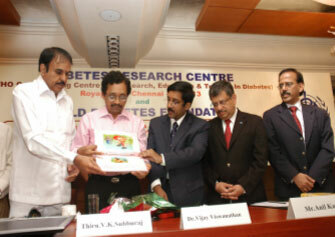 Mandal (2nd from left) & Mr. V. Gopinathan, Chief Executive, Diabetes Research Centre (extreme right) are in the picture. DIASTEPTM footwear has been uniquely designed for people with diabetes with lower risk of foot ulcers. Apart from these features, a specially derived angle of slant has been provided in the sole to give the "rocker" effect which is used to offload pressure from planter surface of the feet. All these features, incorporated after considerable research and after testing on diabetics at MV Hospital for Diabetes, Royapuram, Chennai make DIASTEPTM footwear an essential item for people with diabetes. Constant wear of these footwear will prevent foot ulcers and foot infection. 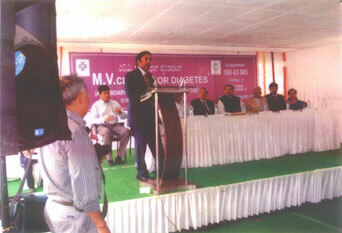 A SEMINAR ON SOCIO ECONOMIC IMPACT OF DIABETES AND ITS COMPLICATIONS CONDUCTED BY M.V. HOSPITAL FOR DIABETES & DIABETES RESEARCH CENTRE ON SATURDAY, 12th SEPTEMBER 2009 AT RUSSIAN CULTURAL CENTRE , TEYNAMPET, CHENNAI. 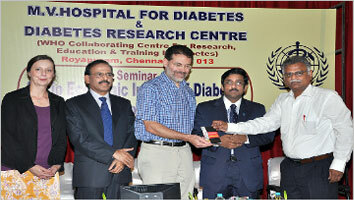 M V Hospital for Diabetes and Diabetes Research Centre, Royapuram, Chennai convened the first of its kind Seminar. 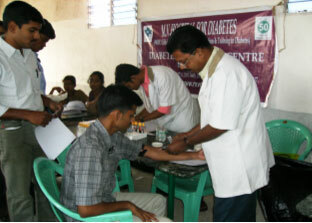 Diabetic Patients in India is expected to increase to 57 million in the year 2025, and it has become a challenge too. Diabetic patients spend three times more for their diabetes care than other ailments. This Seminar focused on framing strategies to combat the Economic Burden of Non-Communicable Diseases including Diabetes and the Panelists involved for discussions were from the Insurance sector, World Health Organization, Government of Tamilnadu, ISRO, Pharmaceutical Industry, Institute of Public Health and Health Care Consultants. This Seminar also witnessed the presence of Economic & Sociology faculties, PhD., & M.Phil scholars from the leading Colleges across Chennai. Photo (Left Above) Mr. Andrew T. Simkin, US Consulate General, Chennai [2nd from left ] launching the programme on "Sensitizing Medical Professionals on the Socio Economics of Health Care and Diabetes". Dr. Vijay Viswanathan, Managing Director M.V.Hospital for Diabetes & Diabetes Research Centre, Royapuram [3rd from left), Dr.T.N.Ravisankar, Hony.Secretary, IMA (Tamil Nadu State Chapter) [Extreme Right] & Dr. S.N. 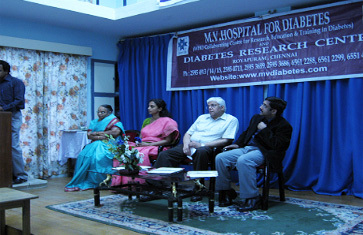 Narasingan, Dean, Diabetes Research Centre [Extreme Left] are also seen. Photo (Right Above) Mr. Andrew T. Simkin, US Consulate General, Chennai [3rd from left] releasing the manual on "Socio Economics in Diabetes Care" and the first copy of the manual being received by Dr.T.N.Ravisankar [Extreme Right]. Dr.Gojka Roglic, Responsible Officer, WHO Diabetes Programme, Geneva [Extreme Left], Dr. S.N. Narasingan, 2nd from left, Dr. Vijay Viswanathan, 2nd from right are also seen. 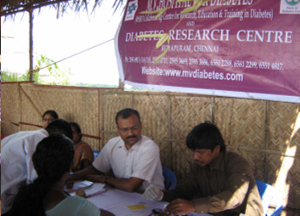 (1st BIGGEST APARTMENT OF ALACRITY IN VELACHERY) ORGANIZED BY M.V.HOSPITAL FOR DIABETES AND DIABETES RESEARCH CENTRE ON SUNDAY, 30th AUGUST, 2009 IN VELACHERY, CHENNAI. 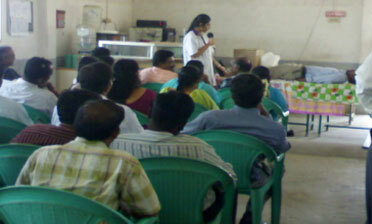 Diabetes Awareness and Screening are in progress and the participants are also seen. DIABETES AWARENESS AND SCREENING CAMP FOR INDIAN AUDIT AND ACCOUNTS DEPARTMENT, EMPLOYEES HELD ON 27TH AND 28th OF JULY, 09 AT THEIR OFFICE AT TEYNAMPET, CHENNAI. Photo (Left) Dr.Vijay Viswanathan, Managing Director, M.V. Hospital for Diabetes & Diabetes Research Centre (4th from right), Mr.Shankar Narayan, Principal Accountant General, (2nd from right), Ms. Ranjini, Accountant General, (3rd from right) and Ms.Nandini, Welfare Officer, (4th from right) are seated at the Diabetes Awareness session & Photo (Right) Diabetes screening is in progress. THE LAUNCH OF THE DRC-WDF PROJECT ON PRIMARY PREVENTION OF DIABETES AMONG TUBERCULOSIS PATIENTS / EDUCATION AND TRAINING IN PREVENTION OF DIABETES FOR TUBERCULOSIS HEALTH PERSONNEL HELD ON SUNDAY, 14th OF JUNE, 2009 AT TAJ MOUNT ROAD, CHENNAI. Thiru V.K.Subburaj, I.A.S., Principal Secretary for Health, Government of Tamilnadu [ 2nd from left] releasing the education materials and launching the project. [3rd from left] Dr. Vijay Viswanathan, Managing Director, M.V.Hospital for Diabetes, Royapuram, [4th from left] Dr. Anil Kapur, Managing Director, World Diabetes Foundation, [Extreme left] Dr. Muruganathan, Member, Medical Council of India, and [Extreme right] Dr. S.N. Narasingan, Dean, DRC are also seen. 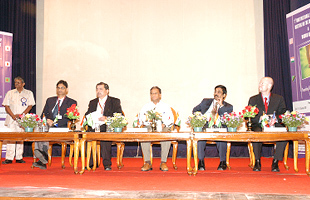 Dr. Vijay Viswanathan addressing the audience (From left to right Mr. Ram Prasad, Mr. Thangaraj, Principal Secretary, Urban Development, Government of Karnataka, Justice Ram Mohan Reddy, Judge High Court of Karnataka, Mr.Veeranna Mathikatti, Chairman, Karnataka Legislative Assembly, Mr.K.N. Subba Reddy, Ex. MLA, Dr.K.V.S.Mahesh, Dr.Vishnupriya Reddy. DIABETES AWARENESS AND DETECTION CAMP HELD ON WEDNESDAY 24th MARCH ,2009 AT SGS CENTRE, TIDAL PARK, THORAIPAKKAM, CHENNAI. Photo left blood tests are being conducted on SGS staff and photo right yoga practice and diabetes awareness being demonstrated to the SGS staff. ROTARY CLUB OF ADYAR VOCATIONAL EXCELLENCE AWARD HELD ON TUESDAY, 24th MARCH, 2009. 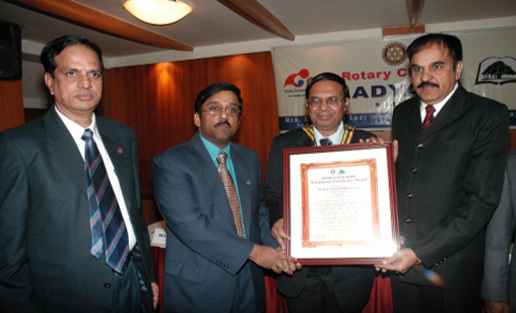 Rotary Club of Adyar Vocational Excellence Award being presented to Dr. Vijay Viswanathan, Managing Director, M.V. Hospital for Diabetes [2nd from left] at a ceremony held on Tuesday, 24th March, 2009 at Hotel Savera. Dr.Muruganathan, Chairman, APITNSC at the extreme right, 2nd from right Rtn.Dr.K.Viswakumar are also seen. Prof. M. Viswanathan Gold Medal Oration & Diabetes Research Centre Gold Medal Oration Awards for the year 2008 were held at GRT Grand on Sunday, 15th February, 2009. These awards are conferred every year on the eminent doctors across India and the World after due deliberations and study by the Scientific Committee of DRC. Accordingly, Prof. M.Viswanathan Gold Medal for the year 2008 was conferred on Dr. N.K.Sethi, M.D., Sr. Advisor (Health) Planning Commission of India. While receiving the gold medal, he thanked the organizers and said "the Govt. of India proposes to extend the pilot project for prevention and control of diabetes, cardio-vascular diseases and stroke across the country in a phased manner". 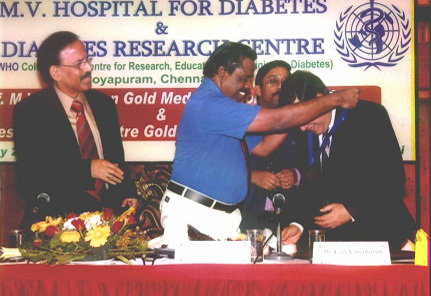 Diabetes Research Centre Gold Medal for the year 2008 was conferred on Dr. B. Kasinath, M.D., FASN., Professor of Medicine, University of Texas, San Antonio, USA. He thanked the organizers and said "the increase in CKD (Chronic Kidney Disease) is now clearly linked to Diabetes prevalence, which in turn, is set off by the burgeoning obesity problems". 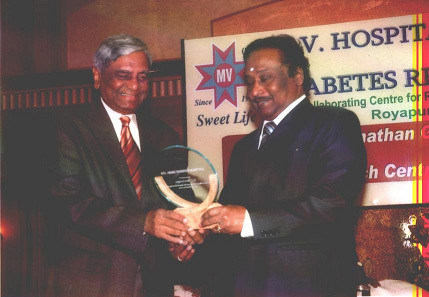 The Life Time Achievements Awards 2008 instituted by the DRC were presented to two legends of the time in the field of Diabetology. Dr. Binode Kumar Sahay and Dr. C. Munichoodappa. Dr S. Elango, Director of Public Health (4th from left) and Dr.N.K.Sethi Sr. Advisor (Health) Planning Commission of India [2nd from right] jointly releasing the DRC Report 2007-08. Dr. Vijay Viswanathan, Managing Director, M.V. Hospital for Diabetes & Diabetes Research Centre [3rd from right] and Dr. C. Munichoodappa, Physician & Diabetologist, Bangalore (1st from left) and Dr. Binode Kumar Sahay, Senior Consultant Physician and Diabetologist, Hyderabad (2nd from left), Dr. S.N.Narasingan, Dean of Studies (3rd from left) and Dr. B. Kasinath, Prof. of Medicine, University of Texas, San Antonio, USA, (extreme right) are in the picture above. 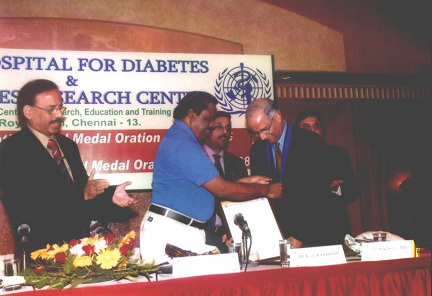 Prof. M.Viswanathan Gold Medal 2008 was presented to Dr.N.K.Sethi, Sr. Advisor (Health), Planning Commission of India, New Delhi by Dr. S. Elango, Director of Public Health, Govt. of Tamil Nadu. Dr. S.N.Narasingan, Dean of Studies and Dr.Vijay Viswanathan, Managing Director, M.V. Hospitals are seen in the picture above. 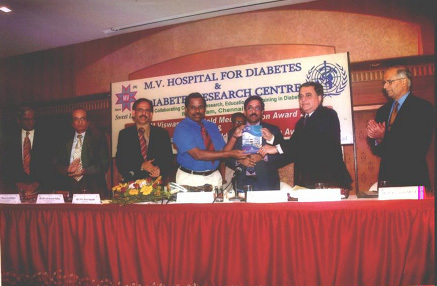 Diabetes Research Centre Gold Medal 2008 was presented to Dr. B. Kasinath, M.D., FASN, Prof. of Medicine, University of Texas by Dr. S. Elango, Director of Public Health, Govt. of Tamil Nadu. Dr. S.N.Narasingan, Dean of Studies, Dr.Vijay Viswanathan and Dr.N.K.Sethi, Sr. Advisor (Health), Planning Commission of India, New Delhi are in the picture. 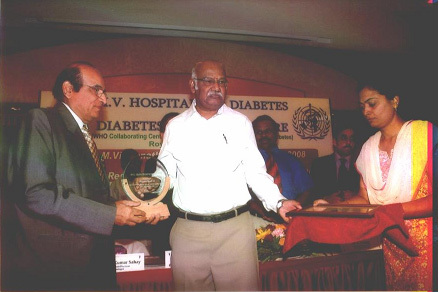 Life Time Achievement Award – 2008, the memento was presented to Dr. C. Munichoodappa, Physician and Diabetologist, Bangalore by Dr. S.K.Rajan, Board of Studies, The Tamil Nadu Dr. MGR Medical University. 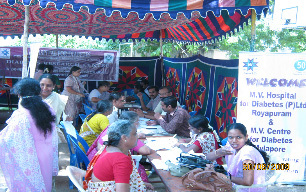 DIABETES AWARENESS AND SCREEING CAMP HELD ON THE PREMISES OF SRI AYYAPPA POONKAVANAM, 38, VELLANUR PANCHAYAT, RED HILLS-AVADI ROAD, ARIKKAMEDU, CHENNAI ON SUNDAY, 11th JANUARY, 2009. 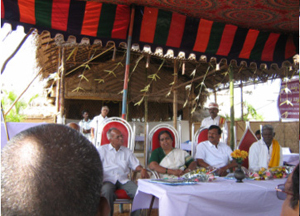 Sitting on the dais [photo left] Sri K.N.Gopalakrihnan Nair, President – Sri Ayyappa Seva Samajam, 2nd from left Smt. Leena Nair, I.A.S., Principal Secretary, Government of Tamil Nadu, 3rd from left Shri G. Sundaramurthi, I.A.S., Collector, Thiruvallur District and on the extreme right Shri K.Arunachalam, President, Vellanur Panchayat & the photo above [right] diabetes awareness and screening camp of the institute being conducted.